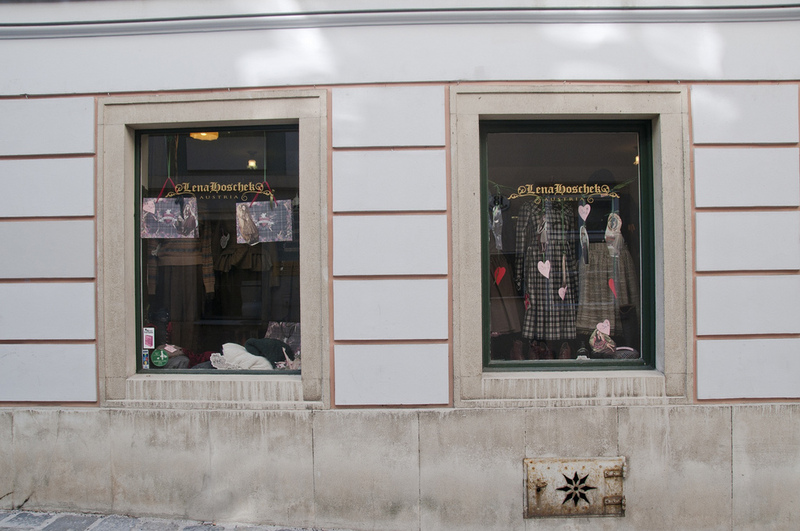 Right inside the store we found a rack of some of the most incredibly beautiful handmade dirndls I'd ever seen. In addition to producing seasonal lines of skirts, jackets, pants, and shirts, Ms. Hoschek creates some really lovely dirndls. We figured that unlike a full dirndl, it was something she could wear more often. I'll try to convince her to let me take a picture of it outside once things warm up. She also tried on the sailor pants in the next photo, but thought they were a little too baggy at the bottom for her taste. But how badass does this girl look in them?